Peter Kephart's 'Erratic With ..
Evan Garza has found his niche in the art world. Evan Garza grew up in a house filled with Latin American artwork and spent many weekends traipsing through the halls of Houston’s many acclaimed art museums, including the Menil Collection, the Rothko Chapel and the Contemporary Arts Museum. Back then, however, he never noticed or acknowledged the effect art had on him. He figured that every kid went to museums and lived in art-filled homes. When Garza was almost out of college, a friend opened a gallery, and he casually volunteered his help, not realizing that it would be the start of a successful career in art. 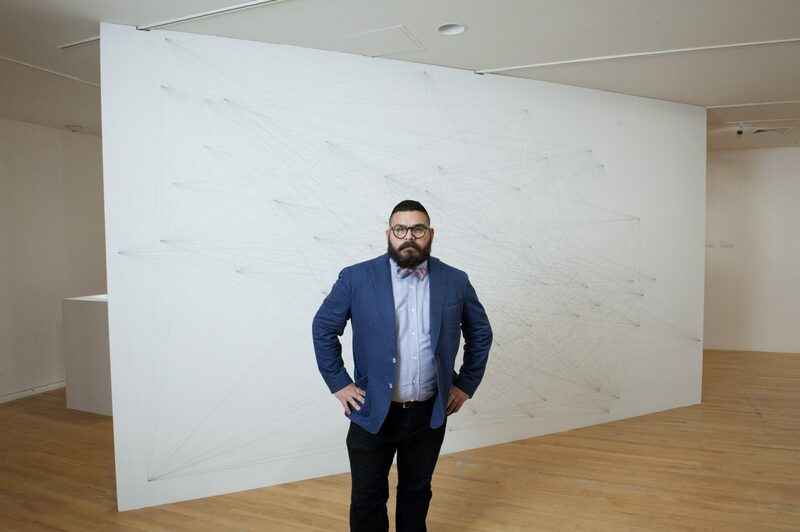 Today, Garza has settled in as the exhibition and programs coordinator for the School of the Museum of Fine Arts in Boston after stints at a few other commercial galleries, as editor-at-large of New American Paintings and as a curator for the Villa Victoria Center for the Arts in Boston’s South End. Four years ago, he co-founded the first artist residency exclusively for gay, lesbian, bisexual, transgendered and questioning (LGBTQ) artists on New York’s Fire Island. He lives in Boston with his husband, Michael Brodeur, an assistant arts editor at the Boston Globe. Art Business News: What do you do in your job as an exhibition and programs coordinator at the Museum School? Evan Garza: Essentially, it’s a creative-support role. We have a gallery program, and the coordinator is responsible for supporting the curator, for supporting any guest curators, for supporting the vision of the exhibition and any sort of related programming that may go alongside it. Occasionally, I curate exhibitions, and I curate [exhibitions at] the museum school, as well, which is always very exciting. I also am in charge of running our visiting artist lecture series here at the school and at the Museum of Fine Arts, Boston. ABN: How do you choose visiting artists to bring to the school? EG: That’s a conversation that I have with faculty, and they essentially make suggestions for artists that they would like to include in their curriculum. Many of the artists that we bring to the museum school to give lectures and perform studio visits with students are artists who are really engaged in interdisciplinary practices or artists who have experience as educators and working directly with young artists. But primarily the visiting artists who are selected are artists whose practices reveal pioneering qualities and really engaging disciplines. ABN: How does working for a nonprofit such as the museum school differ from working in a commercial gallery? EG: It’s inherently different. I realized as I was working for commercial galleries that what I was really interested in was not making a sale but rather engaging someone or an audience in ideas. [I had an interest] in all the concepts regarding practice, materials, conceptual engagements and all the issues that relate to the actual work itself and then the issues related to how works create a contextual environment for the viewer when they’re installed in an exhibition space. Those ideas were much more important to me than any sort of commercial aspect. ABN: Are you an artist yourself? EG: No. I’m a curator and a writer, and I run a queer-artist residency in New York. ABN: What inspired the creation of that residency program? EG: Fire Island Artist Residency was inspired by the need to preserve the existing queer-art-making history on Fire Island. It’s a decades-old history. Cherry Grove is the oldest gay/queer community in the United States; it was founded in the late 1800s. There is a very long history there, and we felt it would be extraordinary to bring artists to that location to foster connections with the island and its history and really see how that context alters the work in some way. We’re just about to embark on our fourth summer out there. ABN: Are the Fire Island artists usually young people or artists across all spectrums? EG: The Fire Island Artist Residency is exclusively for emerging LGBTQ artists. Age really doesn’t factor into it; the emerging part really just has to do with where they are in their careers. ABN: You have mentioned in the past that you are turned off by artists who can’t talk or write about their work. Why do you think that’s so important for artists to be able to do? EG: I think it’s really important from a professional standpoint. Art is experiential. It’s one thing to be able to experience the work as a viewer, but that’s the relationship between the viewer and the object or the viewer and the work. The other side of that coin is what the artist is capable of doing as an artist and as a professional. So you need to be able to effectively communicate your vision as an artist and speak about your practice in an intelligent way, both verbally and in writing. It’s an invaluable skill. ABN: What are the challenges in writing about art? EG: The challenges are really to be able to say in words what it is you wish to communicate visually. I think the artists that do struggle to make that connection are those who are usually stronger one way or another. It’s really an internal dialogue; it’s really about artists’ ability to have a conversation with themselves about what it is that they’re interested in exploring. [Consider] the minimalists or conceptual artists of the 20th century. That work was formally very simple. Formally, it was very redactive and simple and lots of lines and color and how those things sort of interact for the viewer. But then all the description of that work was all so incredibly intense. The source where all of that work really began and the nature of those concepts was really very deep and intense. I think it’s all in describing the visual and in describing the conflation of ideas and concepts and interests that are really paramount for the artist to be able to do. ABN: Your husband is a writer. What role do you think art, both visual and written, plays in your relationship with him? EG: It’s just one of the things that we enjoy. We also really, really love watching “House of Cards.” It’s one of the myriad things that we enjoy together. There are times that we have conversations about work. Sometimes, we have debates about work, but what’s great is [that] I have a partner that I can have that conversation with. That’s really what it boils down to. I have a husband that I’m able to share that with. It’s really just one of the many things that we get to share, which is awesome. ABN: What are your favorite places for discovering new artists? EG: Studios. I really make it a point to get in as many studios as possible, which is why it’s been so exciting working at the museum school because I’m surrounded by artists at all hours of the day. And then when I leave the school, it’s also really important for me to be in studios here in Boston, and I’m constantly doing studio visits in New York. Even when I go home to Texas to visit my family, I make time to do studio visits with artists because that’s really where those moments happen. It’s very much about being active and searching for new ideas, new engagements, new disciplines and that sort of thing. ABN: What trends have you seen emerging from the students in the MFA School or the artists you work with at the Fire Island Residency? EG: That’s a more difficult question because I really sort of reject the notion of trends, just as a concept. It’s also just a little bit more difficult to answer because there are two things at play, right? There are two different communities there. One is this community, the museum school, which is by nature an interdisciplinary art school where degrees are not granted in a specific discipline. So you won’t get your masters’ in painting; you’re going to get it in a studio program. You’re welcome to focus on drawing or performance or ceramics or sculpture or painting or all of the above, so it’s a highly mixed environment where disciplines are really butting up against one another and blurring between one another. And then on Fire Island, those decisions are made by our jurors; who choose the five artists to come out every year. Every year; the jurors change; we invite different professionals to make those decisions, so the dynamic of the program, by virtue of its constructs, changes on an annual basis. While interests sometimes might be the same, the approaches will always be very different. That’s more of a difficult question that I would prefer to avoid because I just don’t think that trends amount to very much at all. ABN: Is there an exhibit that you’ve curated that you’re most proud of? EG: That’s another really tough one because I’m so proud of all the artists that I’ve been able to work with and projects I’ve been able to work on. The one that people tend to bring up the most often when I speak to colleagues and professionals is “Paint Things: Beyond the Stretcher,” which I co-curated with Dina Deitsch for deCordova Sculpture Park and Museum. That was a really dynamic show. It was a really groundbreaking exhibition that Dina and I worked on for almost two years. It was really critically acclaimed when it opened, and it’s one that faculty and students and artists and colleagues and curators come to me all the time to make comments on or engage in a discussion about, and it’s one that I’m particularly proud of. As of press time, Evan Garza was transitioning out of his role with the SMFA in order to focus full-time on the Fire Island Artist Residency.